I wasn’t looking forward to the iPad 2 announcement this week. You see, I’ve been told in no uncertain terms that I must refrain from buying ‘buttons and technology’ this year due to the impending wedding bill that is, admittedly, far more important. However, I love my iPad and I didn’t want to see it shuffle discreetly into the corner of the room, head bowed and gently weeping as it discovered it was suddenly an ‘old’ model. Wednesday’s iPad 2 announcement seemed certain to make that an inevitable consequence. iPad 2 is thinner. This means it looks 33% better than the old model. When you look at it side on. It’s faster. The ‘old’ iPad is no slouch and as mine is used almost primarily for web surfing, reading the paper and task management, I’m not too fussed. I’m even less fussed about graphics that are nine times faster. iOS is, after all, a great gaming platform which is rendered as good as useless by the control surface (download any game which features an onscreen joystick and tell me otherwise). It has cameras. I can’t think of a more awkward and dickhead-inducing way of taking photos than via an iPad. Facetime? I can do that on my iPhone and Macbook. Photobooth is hilarious but only for about fifteen minutes. Plus, I have that on my Macbook, too. It comes in white. Granted. This is very cool (and not a lie, like the iPhone 4’s mysterious AWOL white brother). Apple claim the new unit is unreservedly deserving of the number ‘2’ moniker. I’m not so sure. It is, quite clearly, a 3Gs-type upgrade. 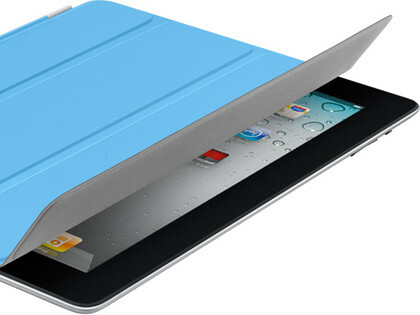 The real next generation iPad will be with us in 2011. And I’m happy to wait. There was one thing, though. Something (as is always the case with Apple) highly unexpected; the case. Or cover, to be more precise in this instance. In one, clicky, flappy, magnetised motion, they’ve done it again. The cover, which effortlessly attaches itself to the side of the iPad and covers just the screen, is almost enough to make you want to upgrade to what is essentially the same product you already own. It looks brilliant. The sort of thing you could just put on and take off again and again, all day. Alas… I’m sticking to my guns and the advice of my better half. I’m off to reassure my iPad that it has nothing to worry about.